The Champions League qualifying initiative swung away from Manchester United again as Louis van Gaal's side lost 3-2 to West Ham in an incredible last competitive match at Upton Park. The Reds travelled to East London knowing that two wins in the final two league games against the Hammers and Bournemouth would clinch fourth place in the Barclays Premier League. But despite a brilliant double from the in-form Anthony Martial, the Reds were ultimately defeated by strikes from Diafra Sakho, Michail Antonio and Winston Reid as the hosts turned the game on its head in the final 15 minutes. With one game remaining, United lie two points behind Manchester City and must now hope Swansea City beat the Blues in South Wales while ensuring three home points are collected when Bournemouth visit Old Trafford. After a dramatic arrival at Upton Park for the Reds following an attack on the team bus, resulting in a 45-minute delay to kick-off, there was some positive team news with three key players returning after missing the slender 1-0 win at Norwich City. Martial recovered from the problem suffered in the warm-up at Carrow Road, while the rested Daley Blind and Marcus Rashford also started. The atmosphere was electric at kick-off and it didn’t take long for the place to get even livelier when Sakho gave the hosts the ideal start on 10 minutes. Manuel Lanzini found space down the left and picked out a cross for the unmarked Senegal striker who saw his deflected effort spin out of the reach of David De Gea. As you’d expect for a team playing their final match at their 112-year-old stadium and wanting to give it the perfect send-off, the tempo was fast and furious. So frantic in fact that the Reds struggled to gain any foothold in the game in the opening half an hour as West Ham threatened to extend their advantage on a number of occasions. After Dimitri Payet had shot straight at De Gea, the Spanish stopper brilliantly blocked an Andy Carroll effort with his feet after being put clear on goal far too easily. De Gea and United breathed a sigh of relief soon after when Antonio headed the ball home from almost under the crossbar after a deflected, looping cross from Mark Noble, but the ball was deemed to have already veered out of play. 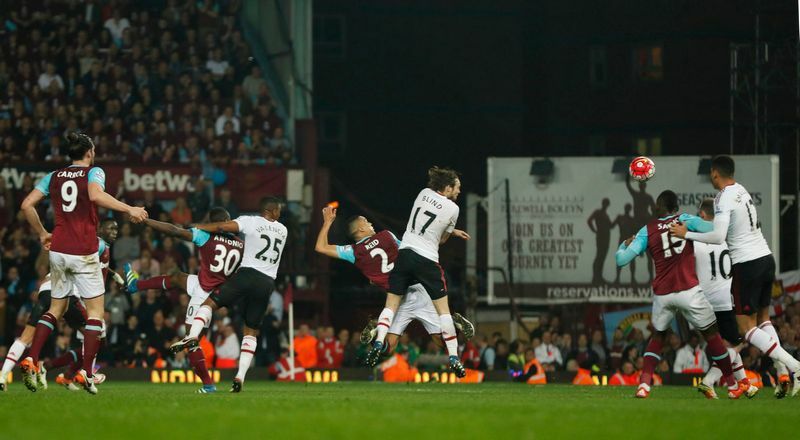 Further efforts followed before the break – an off-target Payet curler and a free header over the bar from Sakho - as United made it back to the dressing room just one goal down. A shout for a penalty after Martial went down under an Antonio challenge on the stroke of half-time was about all the Reds had to reflect on. Van Gaal made a personnel change at the restart with former Hammers midfielder Michael Carrick replacing Morgan Schneiderlin as the Reds looked to turn things around. Six minutes later parity was restored after the visitors' best move of the match. A De Gea goal-kick dropped to Rashford who slipped a pass to Mata and when the Spaniard's low centre found its way to Martial, the Frenchman tapped home from close range. Game well and truly on. The goal appeared to motivate the hosts, however, and after Payet had hit the side-netting with a long-ranger, the French midfielder’s free-kick on 56 minutes found Sakho completely unmarked in the box, but he headed well over when it looked easier to score. After the Reds had weathered another mini storm, Mata and Rashford almost created an opening with some neat play inside the box, but Rashford's deflected backheel dropped just beyond Ander Herrera. 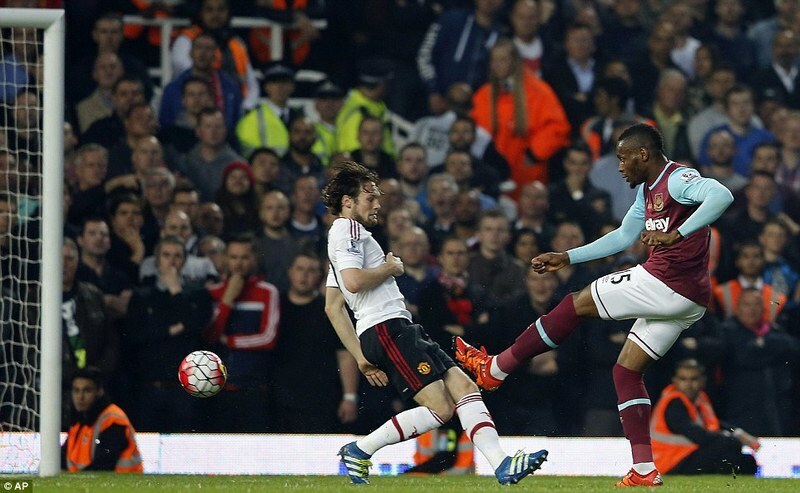 Martial headed a Carroll header off the line before the Frenchman worked his magic once again at the other end. Determined play from Rooney in midfield led to Rashford finding Martial who sprinted down the left and he somehow angled home a superb finish for his 17th strike of the campaign. 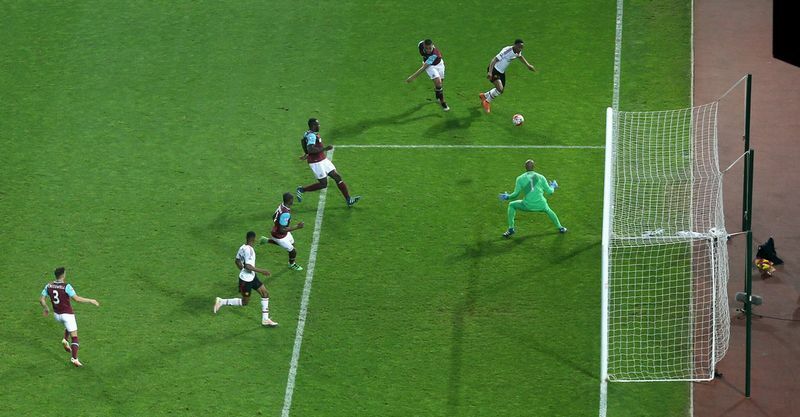 The lead lasted all of four minutes though when Payet, after seeing his initial free-kick blocked, pinged a ball to Antonio in the box and the defender headed into the top corner. The net bulged again four minutes later as Reid rose to head home Payet’s free-kick to send the home fans into raptures and place a huge dent in the Reds' Champions League hopes. The fight for a top-four place will still go to the final day, but United's fate now lies in the hands of others. West Ham: Randolph, Antonio, Reid, Ogbonna, Cresswell, Noble, Kouyate, Sakho (Tomkins 84), Lanzini (Obiang 84), Payet (Valencia 90), Carroll. Subs not used: Spiegel, Collins, Moses, Emenike. United: De Gea, Valencia (Januzaj 87), Smalling, Blind, Rojo, Herrera (Lingard 83), Schneiderlin (Carrick 46), Rooney, Mata, Rashford, Martial. Subs not used: Romero, Borthwick-Jackson, Jones, Memphis.